Richard Thomas Griffiths, OBE (31 July 1947 – 28 March 2013) was a British movie, stage, television, Actor and Voice actor. He appeared in many movies, plays, and television programs. Griffiths is mostly known for his roles as Harry Potter's Uncle Vernon Dursley in the Harry Potter movie series, Uncle Monty in Withnail and I, Henry Crabbe in Pie in the Sky, and as King George II in Pirates of the Caribbean: On Stranger Tides. He won a Laurence Olivier Award, a Drama Desk Award, and a Tony Award. Griffiths was born in Thornaby-on-Tees, North Riding of Yorkshire, England on 31 July 1947. He lived in Manchester, England during his early adulthood. He was raised as Roman Catholic. His parents were both deaf, and he learned sign language at an early age so that he could communicate with them. During his childhood he tried to run away from home many times. He dropped out of Our Lady & St Bede School in Stockton-on-Tees at age 15. Griffiths was educated at Stockton & Billingham College and at Manchester School of Theatre. Griffiths appeared as King George II in 2011's Pirates of the Caribbean: On Stranger Tides. He appeared in the first episode of the television series Episodes as Julian Bullard. Griffiths once got a standing ovation after ejecting a female audience member from his West End play. Her ringtone sounded for the third time during Griffiths play. In April 2012, Griffiths starred, with Danny DeVito, in a revival of the Neil Simon play The Sunshine Boys. The show was played at the Savoy Theatre from 27 April 2012, opening on 17 May and playing a limited 12-week season until 28 July. Griffiths was married to Heather Gibson from 1980 until his death in 2013. He had no children. Griffiths died on 28 March 2013 during heart surgery in Coventry, West Midlands, England, aged 65.Many reactions were posted on Twitter after his death. Some were from Daniel Radcliffe, Warwick Davis, and Richard E. Grant. His funeral took place at Holy Trinity Church in Stratford-upon-Avon, Warwickshire on 9 April 2013, with over four hundred mourners, including Daniel Radcliffe, Alan Bennett, Michael Palin, Richard E. Grant, Jack Whitehall and Judi Dench. He was awarded an honorary degree from Teesside University in 2006 and was appointed an Officer of the Order of the British Empire (OBE) in the 2008 New Year Honours. ↑ "Richard Griffiths Biography". FilmReference.com. 2008. Retrieved 11 April 2008. ↑ Laurence, Charles. "Part 3 of Griffiths interview". Saga Magazine. Retrieved 11 April 2008. 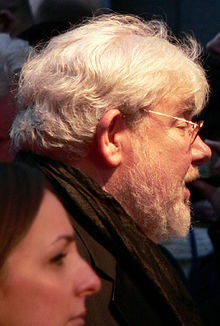 ↑ "British actor Richard Griffiths, a stage legend and Harry Potter's Uncle Vernon, dies at 65". Washington Post. 29 March 2013. Retrieved 29 March 2013. ↑ "Harry Potter actor Richard Griffiths dies". BBC Online. 29 March 2013. Retrieved 29 March 2013. ↑ "Daniel Radcliffe leads tributes to Richard Griffiths". CBS News. 29 March 2013. Retrieved 30 March 2013. This page was last changed on 23 October 2018, at 10:53.